Torrent System Updated | Team OS : Your Only Destination To Custom OS !! Hello Everyone, We have updated Our Torrent System and Fixed All Bugs found until now. We have made some improvements and modifications in our Torrent System. All of those changes and updates are mentioned below. 1. Torrent Tracker Status : Now onward you will see color in Torrent Tracker , Green Color indicates Tracker is Live and Red Color indicates Tracker is Offline, Do Note that this stat is updated every 1 hour so if tracker is offline than you may see the change here after one hour. 2. Freeleech System Fixed : We have fixed the Freeleech system. So now onward we are removing Global Freeleech and only Torrents with freeleech enabled will be Freeleech and for rest others downloads will be counted. Well while talking about freeleech we have made one more improvement in it, now thread title shows Freeleech as prefix for Freeleech Torrents. 3. 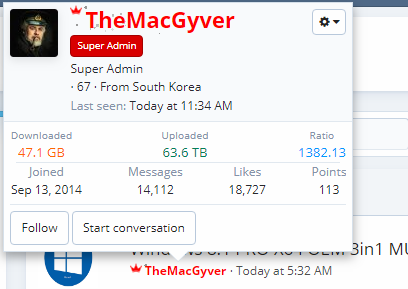 Member Torrent Stats : Now Member's Torrent Stats are Visible in Tooltip and Members profile page. 4. Request Reseed Alert : Now When a User Requests for Reseed , an alert is send to Torrent Snatchers and Torrent Uploader regarding the request made by user. 5. Seeders/Leechers and Torrents Links Fixed : Earlier in Members Profile when we want to go to second page of any users torrent list it used to go to the main torrents page instead of that users torrents second page , which is no more the case , it has been fixed. Thanks for the info & improvements. Thanks for the info and hard work! Thanks for the work! Progress marches on. Hello Everyone, We have updated Our Torrent and Fixed All Bugs found until now. We have made some improvements and modifications in our Torrent System. All of those changes and updates are mentioned below. 1. Torrent Tracker Status : Now onward you will see color in Torrent Tracker , Green Color indicates Tracker is Live and Red Color indicates Tracker is Offline, Do Not that this stat is updated every 1 hour so if tracker is offline than you may see the change here after one hour. Wonderful work. These improvements will make for a more easy to use experience for us all. Thank you kindly @xendev . Amazing. Thanks @xendev bro. Minor things that needed BIG fixing. Thanks again for all your hard work, especially for fixing the torrent page on user's profiles @xendev. I cann't download anything cause my ratio is 0.11 and 0.2 is needed. How to get it? ...no more Green cColor, now Blue is Color ...the torrent icon must be turned off from the hidden icons and re-engage it and it works ... "Blue"
1. Either reseed your downloaded files or keep them active to get bonus points. 2. Check your bonus points , if you have enough points than convert them to upload credits. 3. Become Vip and Download as much as you want. 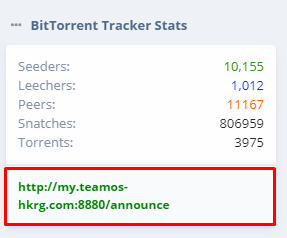 In the post i was not talking about the color in torrent client, i was talking about the BitTorrent Tracker Stats shown in sidebar on homepage. Check screenshot added.